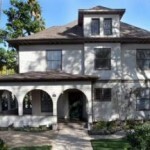 As you may have heard, there is a great deal of home improvement going on in the Highland Park neighborhood these days. 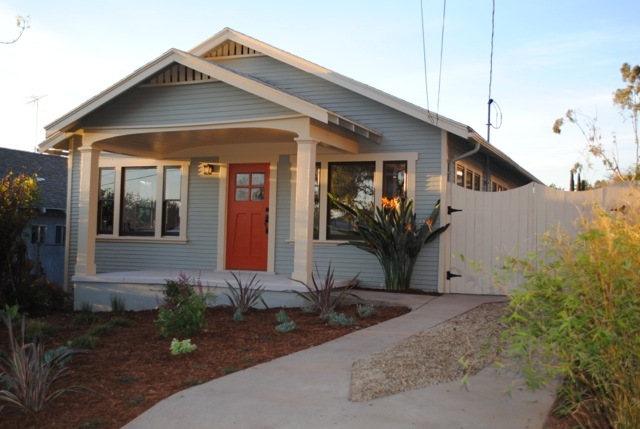 Investors have been busy “flipping” long-neglected homes for new design-savvy buyers. Thankfully, most people involved seem to realize that the traditional styling of these homes adds a great deal to their desirability. 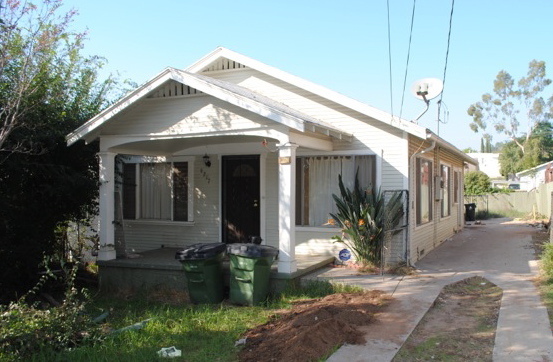 For this project, the investors wanted to add back the type of character that this poor ’20s bungalow had lost over time. 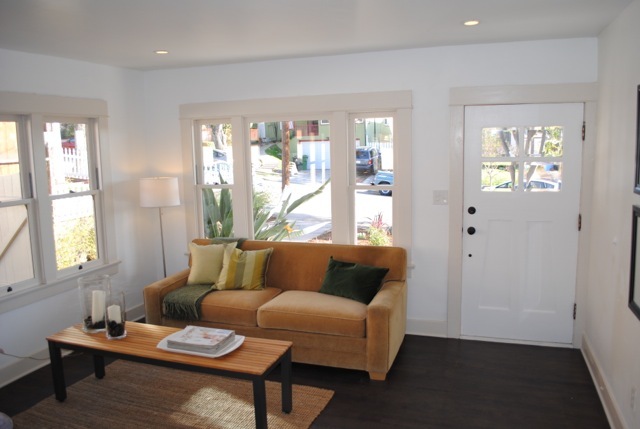 We provided new dual-glazed Douglas Fir period-style windows and installed an original Craftsman style entry door that they found at Silverlake Salvage in Pasadena. I think the result speaks for itself. 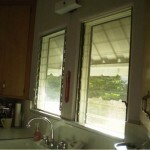 More jalousie and aluminum windows replaced with wood. These are new replica wood sash in old 1880s jambs, reusing the original rope-hung system of weights and pulleys. No stucco or siding was harmed in the restoration of these windows. This type of change costs about half of what a complete new window would cost. While they may not be appropriate in your Victorian or Craftsman home, louver (jalousie) windows are often the original windows in the modernist houses of the 1950s. Some 60 years later, many of the mechanisms that operate these windows are now failing with some of the glass panes refusing to close or open with the rest of them. If that’s the case, we are able to help. We maintain an extensive stock of mechanisms removed while reinstalling original style wood sash on older homes. Chances are, we have a match for your originals. In addition, we are able to repair broken mechanisms. The aluminum or stainless steel armature of these mechanisms sometimes breaks off from the pieces that hold the glass in place. With care (and the right welding torch), these mechanisms can serve for many additional years. Feel free to get in touch with us to learn more about repairing your broken louver jalousies. A nice article about a couple of New York homeowners undoing a prior owner’s work. Their real estate agent probably didn’t see them as a drawback. 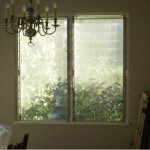 But by reinstalling vintage steel windows, they regained a great deal of their home’s character. I’m only left wondering how they were able to get permits for a project like this; namely, replacing dual-glazed with single glazed panes. 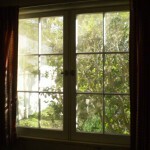 Also, while I’m not personally familiar with them (working as I do, in Los Angeles), do the homeowners use interior storms with their new vintage windows? A couple decides to ditch their home’s modern-day replacement windows and reinstall vintage steel casements. A Tudor house in New York makes a dramatic case for the importance of original windows. 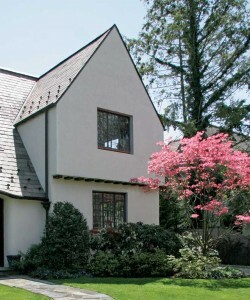 Frank Vaccari was raised in a Tudor house and always loved the style. His wife, Donna, thought Tudors were endearing and had longed to live in one. So when the house-hunting couple stumbled upon a 1920s Tudor for sale in Westchester County, New York, about seven years ago, they jumped on it. “It was in a nice Tudor community,” says Frank, “but it had some unfortunate updates. There was a ragged asphalt roof that needed to be torn off, and the windows were high-tech modern replacements.” Several windows also leaked when it rained. They brought Seekircher in to evaluate their windows to see if swapping them out for something more akin to the originals was viable. Seekircher told them that reinstalling vintage steel casements was indeed possible, and would make a huge difference in their home’s appearance—but that it would be a big project that would also involve repairing plaster and stucco, and painting the house inside and out. Because they’d only recently moved in, the Vaccaris decided to wait. 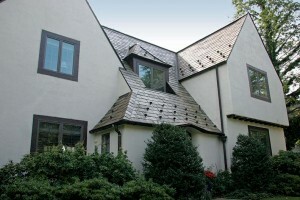 They could only handle one big project at a time—and restoring the slate roof had to take precedence. Instead, Frank took some time to study up on his options. “I did a lot of research on windows, and even got some quotes from modern manufacturers,” Frank says. “They were all trying to sell me on a replica window, but those didn’t have true divided lights—so they took on a whole different look from the outside.” He looked into modern-day Hope’s steel windows, but thought their double-paned glass wasn’t quite the right fit for his house. Frank even tracked down a Manhattan-based restorer who regularly outfits town houses to Landmarks Preservation Commission standards to seek his advice. “Do the vintage Hope’s; don’t even think about it,” he said. “They’re the real deal—the original stuff that was in the house.” Six years after Frank first contacted Seekircher, he called him back, ready to commit to the vintage Hope’s. The Vaccaris had some new decisions to make. While they were already hooked on true divided lights (instead of the plain single-pane glass also possible with vintage Hope’s), they needed to find the right pattern for their leaded-glass inserts. Seekircher explained that either three or four rectangular lights across each casement would be appropriate for their style and size of house. They settled on three lights across, which meant that—depending upon the height of the window—there would be anywhere from six to nine courses on each casement. Next, Seekircher walked through the house with the Vaccaris, pointing out window openings that had been enlarged when the replacements were installed. “They had a room with a great big replacement window in it that looked out onto the air conditioning units in their backyard,” Seekircher says. “I told them if we went with a smaller window, like what would have been there originally, they would have a better view.” The Vaccaris took his advice and opted to reduce seven windows back to their original sizes. Start to finish, the Vaccaris had to wait about two months for the delivery of their customized 90-year-old casements, which were then installed by a contractor. Seekircher compares the vintage steel frames to old-growth sash, saying, “Steel from the early 1900s is phenomenal; it holds up forever.” He also thinks the longevity of vintage windows makes them a perfect fit for today’s eco-conscious homeowners. Barbara Jones had one stipulation when she was renovating her 1794 farmhouse: keep the original windows. Old windows have acquired a bad reputation over the last few decades as drafty, inefficient and ecologically suspect: fixtures that should be replaced rather than refurbished. But over the last decade or so, homeowners like Ms. Jones are becoming more common. Many people are keeping their old windows, fixing what they have in the name of appearance, history and, for some, cost savings, according to architects, preservationists and window restorers. As the host of “This Old House” and “Ask This Old House” on PBS, Kevin O’Connor has a front-row seat on this shift. Nowadays, he said, when he talks to people about home restoration, windows are the “first and most frequently talked about subject.” Mr. O’Connor and his wife spent years fixing the distinctive windows (some arched, others tiny and on hinges) in an 1894 Queen Anne Victorian in Beverly, Mass., that they owned until recently. “They were as integral to the house as any other component,” Mr. O’Connor said. Ms. McAuley is a speaker this week at the first National Window Preservation Summit in Bledsoe, Ky., where about two dozen people have gathered to help people answer that question by drafting national standards for old-window restoration. Organized by a collaborative of window restorers, the conference is sponsored by, among others, the Preservation Trades Network, a group supporting traditional building trades, and the Kentucky State Historic Preservation Office. The National Trust for Historic Preservation has also made protecting old windows a priority, devoting a section of its Web site to such topics as making old windows last. The group’s site offers a model letter for individuals to use to urge the United States Senate to pass Home Star, an energy bill that would provide tax benefits to homeowners who make old windows more energy-efficient. (The House passed its own Home Star bill this year.) Homeowners can already receive tax benefits for installing efficient new windows. “We’re just trying to spread the word, so people can make good choices,” said Rebecca Harris, a program officer at the trust, who pointed out that installing new windows in old homes, whose original windows often have unusual shapes, can distort the overall architectural design. “They don’t automatically have to go to replacement,” Ms. Harris said of homeowners. Robyn Brothers is one homeowner who regrets doing that. She ripped out the windows of her 1857 Greek Revival home in Marshfield, Mass., replacing them with new thermal-paned ones. 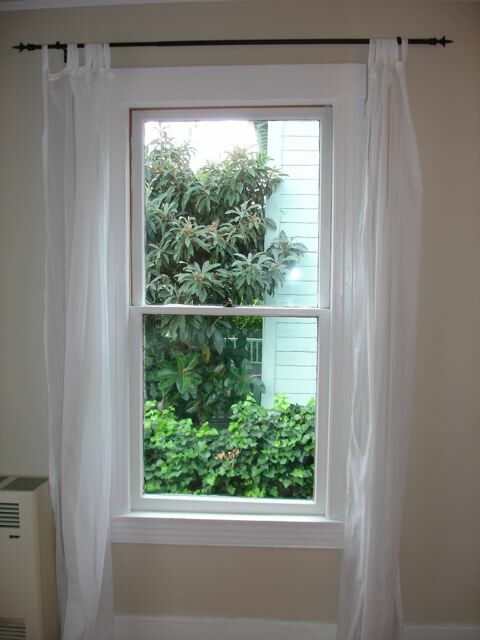 Ms. Brothers hoped the replacements would prevent drafts and save money, but she said she paid a “shocking sum” for “not even high-end” windows. 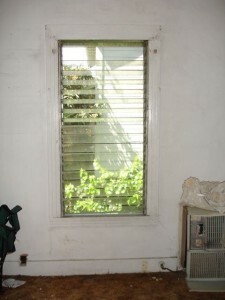 When Ms. Brothers decided to renovate a 1940s home she owns nearby, she insisted on keeping the old windows. The proponents of preserving old windows are trying hard to buck the still-strong belief that new windows are more energy-efficient and environmentally friendly than old ones. They say that preserving old windows means those windows will not be tossed into a landfill, adding to the waste stream, and that old windows are usually made from old-growth wood that can, and often already has, withstood the test of time. 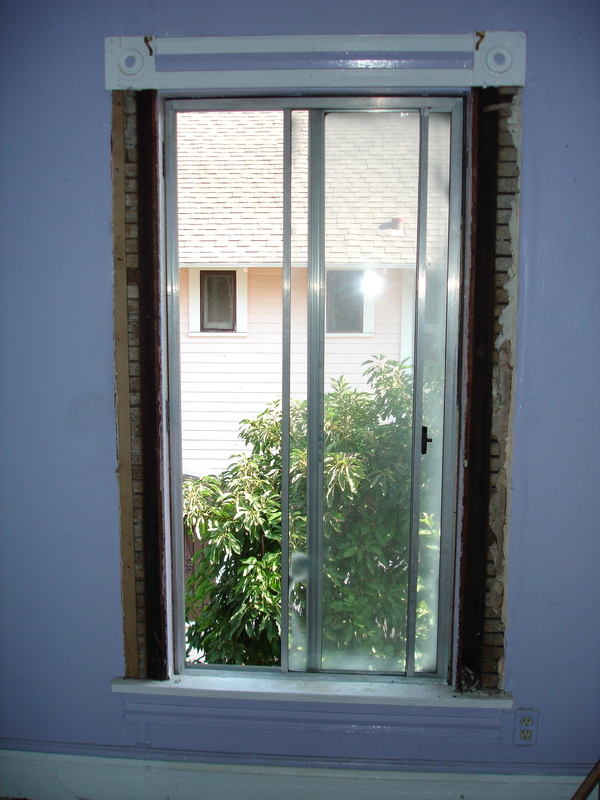 New windows, they say, with their many synthetic components, may not be as durable. Old-window advocates do admit that it is hard for an old window to match the energy efficiency of a new one. But with the right steps it can come very close, said Paul Button, an energy auditor in Manchester, N.H.
For example, Mr. Button recommends installing a boxed cornice, a horizontal box above a window that hides the curtain rod, to help circulate the heat from room radiators around the window area. Also, he said, a good storm window is crucial for maximizing the window’s efficiency. 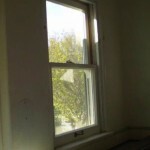 Mr. Button and others have also noted that the maintenance of old windows that are in decent shape can cost as little as a gallon of paint, while new high-efficiency windows can cost thousands of dollars each. 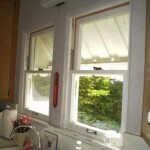 “Stay on the paint, that’s really all there is to it,” said Steve Quillian, the owner of Wood Window Makeover in Tampa, Fla.
Of course, refurbishing may also require other minor tasks, such as caulking, and some window jobs can be complicated. Lead paint must often be completely removed, for example, and salvaging rotted wood, while possible, often requires the help of a professional. In some homes, a previous owner may have painted or caulked the windows permanently shut in the hope of blocking drafts; undoing that measure can be tricky. And some windows are in such bad shape that they simply can’t be saved. At Ms. Jones’s farmhouse, the windows were not in great condition and had to be stripped down to bare wood, cleaned of lead paint and fully refurbished. While she is pleased with the look, the work was costly and the windows can sometimes be hard to operate, which makes her worry about her children opening them in an emergency. “It’s obviously not a seamless operation,” Ms. Jones said as she tried to get one of the windows to stay open, a tricky procedure involving an original pin-and-groove mechanism. But to Ms. Jones and others, preserving the character of their homes is worth it. Joe and Rebecca Titlow bought their red 1721 farmhouse in Bedford, Mass., four years ago, planning to restore it. New windows weren’t even an option; the home is on the National Register of Historic Places. On a muggy morning this month, the window holes on the ground floor of the Titlow farmhouse were covered with plastic sheets, the windows themselves having been popped out for repair. A crew for “This Old House,” which is planning an episode about the home, was preparing to film for the day. The previous owner had caulked and painted the windows shut, Ms. Titlow said, and a major goal was to be able to open them. Alison Hardy, the owner of Window Woman of New England, who was refurbishing the windows, said that they were in reasonably good shape for such an old house, but that some wood rot had to be addressed and some paint stripped. She is also repainting the windows and reglazing them with a soybean-oil based putty. On this day, Ms. Hardy was upstairs, reinstalling a fully refurbished window in its original opening. Its white frame slid up and down easily, just as it presumably had in the early 1700s. “I’m so excited,” Ms. Titlow said. For Ms. McAuley, the window restorer in Oregon, the payoff for such intensive work is both making the homeowner happy and restoring a sense of the past. WHILE the prospect of refurbishing an old window can be daunting, it is usually not difficult if the window is in decent shape. “It’s as easy as going outside and mowing the grass,” said Steve Quillian, the owner of Window Wood Makeover, in Tampa, Fla.
Making sure the window has a fresh coat of paint is the most important step, window restorers say, because it ensures that water rolls off the wood and won’t seep in, causing rot. Homeowners should also check the glaze, the puttylike substance that holds the window in the frame. Glaze can crack and peel with age, allowing wind and the elements to penetrate the window. 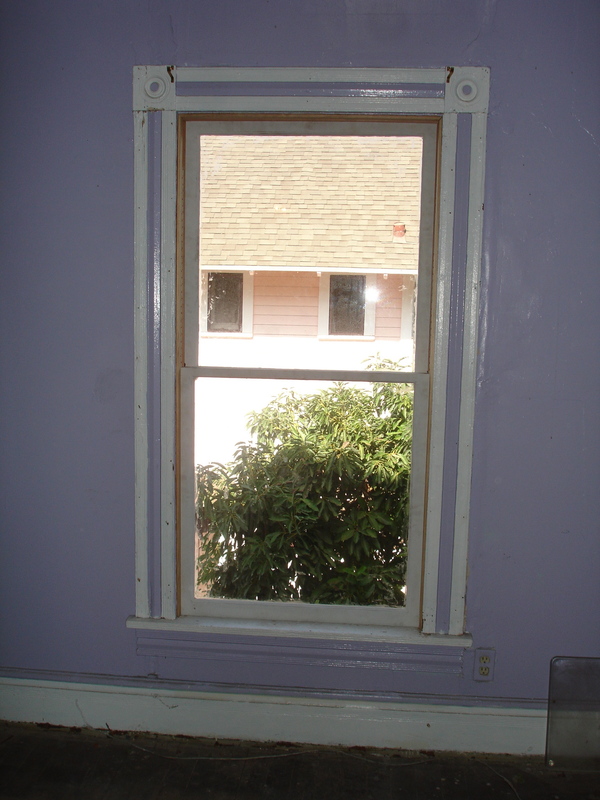 All paint should be stripped off the jambs; except for weatherstripping, the jambs should remain bare wood because a painted surface makes opening and closing the window difficult. If the window has a pulley system, remove all paint from the ropes to help them slide easily. Locks are not just for security; a good one will make the window tight and keep out drafts. 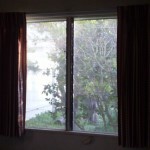 If the area around the window is cold, a thick set of curtains can prevent the chill from seeping into the room. Small areas of wood rot can be easily repaired with epoxy, window restorers say. If it all seems daunting, there are many people who specialize in historic windows, often with a less-is-more ethos. Last week, a group of of prominent window restoration professionals met in Pine Mountain, Kentucky to draft a set of standards for the restoration and weatherizing of historic windows. Their goal is to have a finalized standard for release in December. Such a standard will be a great help to those who advocate for preserving windows because one of the primary hurdles in keeping old windows is a lack of energy efficiency testing to allow homeowners and others an apples-to-apples comparison against new, tested windows. 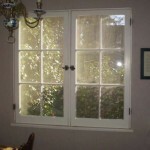 Years ago, I restored my first windows, a couple of dining room windows on my own home which had been changed from wood double-hungs to glass louvers or jalousie windows. Since then, I’ve seen my share of neglected wood windows and can almost understand why midcentury homeowners fell for the louver salesman’s pitch. 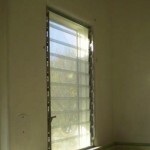 After 30 or more years, their old windows may have been painted shut, had broken ropes or needed reglazing. Plus, these new windows were made of jet-age materials like aluminum and stainless steel (with their siren song of “maintenance free”)! Heck, with these new windows, maybe the old bungalow could look a a bit like those fashionable new modernist homes. In general though, the pitch would have been the same as the one made by today’s vinyl window installers. After living with their new windows for a little while though, the homeowners’ enthusiasm must have faded quickly. While Easterners still smirk at Southern California’s seasons, it does get cool on occasion and anyone who has lived with louvers knows knows that they do a lousy job of keeping that cool weather out. Curtains will still blow in the breeze next to a closed jalousie. Replacing jalousies with original style wood sash is among my favorite window projects. The change is so dramatic and the strong feeling of righting an old wrong is very fulfilling for me and for the homeowner. Here are a few before & after photos of a jalousie removal project which involved the reinstallation of many casement and double-hung sash, thoughtfully stored in the home’s attic decades ago. In just a couple of day’s work, I was able to restore a huge part of this home’s original appearance while dramatically reducing the street noise and cold drafts associated with this failed branch of window evolution. Laundry room “After” with original double-hung sash reinstalled. It looks like one of Detroit’s better known derelict buildings might be getting some attention soon. Built in 1913 and unused since 1988, Michigan Central Station has become an icon of Detroit’s decay. The building’s owner has announced their intention to repair the roof and the hundreds of windows, nearly all of which have been shattered by vandals. Here’s hoping that the work is successful and a new use is found for this grand old place. 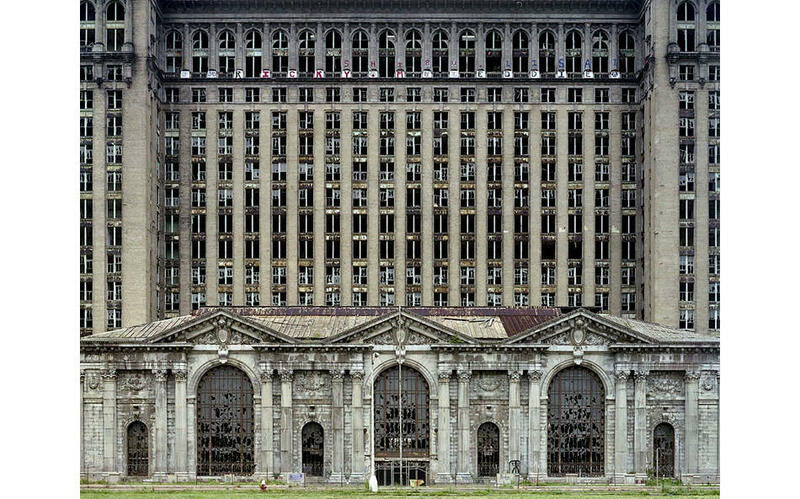 DETROIT – The owner of the Michigan Central Depot plans to replace the roof and windows on the shuttered train station with hopes of attracting a developer for the building that for years has been symbol of Detroit blight. via Owner of shuttered Detroit train station plans improvements with hope of finding developer :: The Republic. An interesting feature on the LA Times site about the recreated moderne Coffee Shop at the former Ambassador Hotel site. Designed by notable architect Paul Williams in 1949, it was one of the few pieces of period design retained or recreated for the site’s reuse.